Having familiarized myself with the earlier, pretty bulky and unwieldy, versions of gadgets supporting DVB-H (that’s Digital Video Broadcast-Handheld, a standard for mobile broadcasting advocated by the DVB project, Nokia, Siemens etc, and in competition with DMB, the Korean version, MediaFLO etc) this next gadget to be out on the market feels like a trip back to sanity. 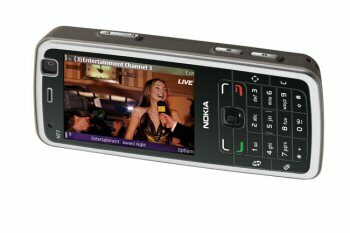 Nokias N77, a new phone in the N-series, is for once a phone that doesn’t try to look like anything but a phone. It has still got DVB-H compatibility, though, which means that you can watch mobile television on it. It’s got a 2,4″ screen with 320×240 pixels resolution and up to 16 million colors, so it perfectly possible to actually watch something on it as well 🙂 And weighing in at 114g, you can lug it around anywhere.